3588/241139 Pte Walter Gratton aged 25 and the son of Benjamin and Mary Gratton of 3 Rose Cottages in Upper Town near Bonsall, Matlock. Walter enlisted in November 1914 and would have arrived in France during 1916. 60573 Pte Albert Edward Hook aged 21 and the son of Emma Annie and the late Frederick Hook of West View on Alfreton Rd. in Derby. Albert had previously served with the 15th and 1/7th Battalions. 91366 Pte. Edwin Harold Hoyle who was the husband of Alice Hoyle of 6 East St. Ilkeston in Derbyshire. Edwin was conscripted in early 1917 and posted to the Sherwood Foresters. 3052/240873 L/Cpl Peter Ryan aged 32 and a fitter from Chapel-en-le-Frith. Peter was from Ballynahinch in County Tipperary and enlisted in October 1914. 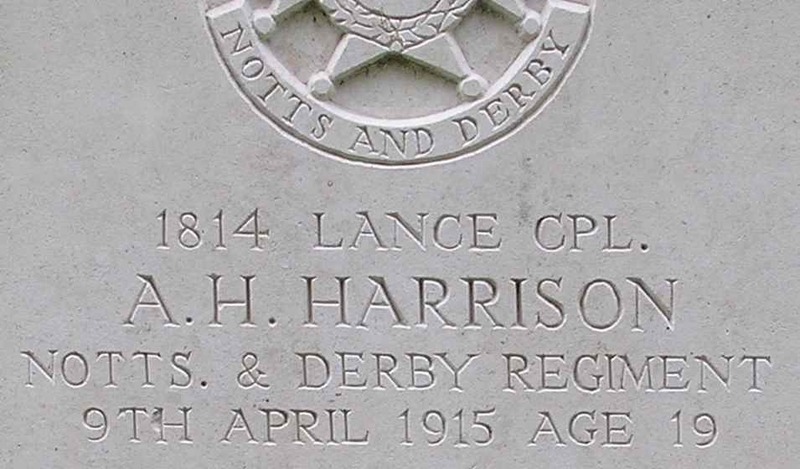 He went to France with the 46th Division in February 1915. He had served a total of 3 years and 317 days overseas, but had only just rejoined the 1/6th Battalion on 31st July. He is commemorated on the Ballynahinch and Chapel War Memorials. All four men are buried in FOUQUIERES CHURCHYARD EXTENSION, Plot IV, Graves F1-3 & 8. This entry was posted in Casualties, Notable event and tagged 3052/240873 L/Cpl Peter Ryan, 3588/241139 Pte Walter Gratton, 60573 Pte Albert Edward Hook, 91366 Pte. Edwin Harold Hoyle, Epinette East Keep on August 31, 2017 by mikebriggs1910.